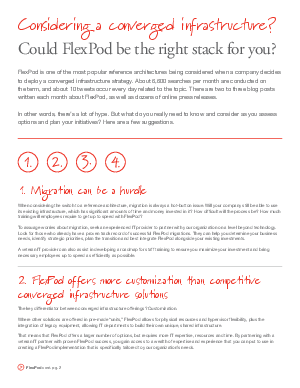 FlexPod is one of the most popular reference architectures being considered when a company decides to deploy a converged infrastructure strategy. About 6,600 searches per month are conducted on the term, and about 10 tweets occur every day related to the topic. There are two to three blog posts written each month about FlexPod, as well as dozens of online press releases. In other words, there’s a lot of hype. But what do you really need to know and consider as you assess options and plan your initiatives? Here are a few suggestions. Sponsored by Logicalis, a Cisco Gold Certified Partner.